TRIP typically gets an overhaul once a year and ahead of changes for early 2012 we’ve started a series of surveys asking people what they like and don’t like about TRIP. I’ve already posted three posts on the first round of results (see here, here and here). This allowed me to draw up a list of proposed changes which I’ve discussed with the TRIP techie – Phil. As a result of this discussion I started a second round of questions, to probe some of the issues raised in the first round of questions. 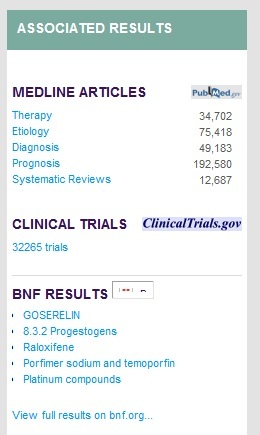 One area of real interest is the ‘Associated results’ on the right-hand side of the TRIP results page (image below). They increase the time it takes for the page to load. It’s not scalable, in that we could put many more resources there – but it wouldn’t work. So, nearly 70% of users want them left alone! This creates a dilemma as to how to increase the number of associated results yet still use no more space. I have some ideas (e.g. use a table or buttons that shows results only when clicked) but one to be worked through with our designers. Irrespective of the outcome – I’m really glad I asked!